Every season in Italy is beautiful in its own way—panettone in winter! The seaside in summer, grape harvest in fall!—but come spring, this country comes alive like no other. And this coming from a die-hard autumn lover, at least when it comes to everywhere else in the world. The top three reasons why I love Italy in the springtime also make it the ideal season to visit. From the very first hints of warm air and longer daylight, Italy blossoms and flowers, and it doesn’t stop. Purple crocuses pop up in the tiny patch of grass outside my apartment building, unplanted and unplanned, but there every year. Tulips are everywhere, and towns host flower festivals, like Messer Tulipano at the Castle of Pralormo. Trees put out magenta, white, and peach blooms in waves; my favorite are the extravagant magnolias found on every street corner and in the parks of Turin (and many other cities), heavy blossoms that open a little further every day until they grow heavy and fall to the ground. Say a little prayer that the spring rainstorms or occasional hailstorm don’t hit during this glorious magnolia week. Fields are awash with color, with red-orange poppies; Umbria is famous for swaths of electric colors; acres and acres of land outside the cities are dotted with crops that bloom, from pears to cherries. I’ve never seen the wisteria killed by frost, or the flower buds eaten by deer. In short, I’ve never seen a country so wreathed in flowers as Italy in the spring. Growing up on the east coast, spring meant final snow days (back before global warming was a thing), freezing wind that made my hair stick in my Smuckers glitter lip gloss (so annoying; also, I hope it’s clear we’re talking about my elementary school days), and long weeks of dirty slush from the melting snow. Spring was mostly a season to be tolerated until summer. Italy fully enjoys the Mediterranean climate, and, at least in the six years that I’ve been here, is blessed with That Perfect Temperature for weeks: jeans and a tee-shirt with a light jacket overtop is all you need to stay comfortable. It’s not total paradise, of course. March and April can be rainy, and, depending on the year, maybe even bring some last flurries of snow in the northern parts. Then there are the aforementioned hailstorms (in Piemonte, at least) that can be brutal but brief. But for travel, in a country that doesn’t believe in air conditioning or even sufficient heating in many of its buildings (no offense, Italians, but you know it’s true), spring weather is perhaps the most comfortable all-around. Just come prepared with an umbrella and some light layers. The markets are overloaded with fresh produce. Why are the months immediately after the holidays—January and February—the hardest of all? One, it’s a combination of the anticlimactic drudgery after the holidays, when the days are cold and short, offering little more than Valentine’s Day as a break. And two, I firmly believe, it’s also because we’re all growing a little bored of cruciferous veggies and the last dry oranges (really; what other seasonal fruit or vegetable do these months offer?). 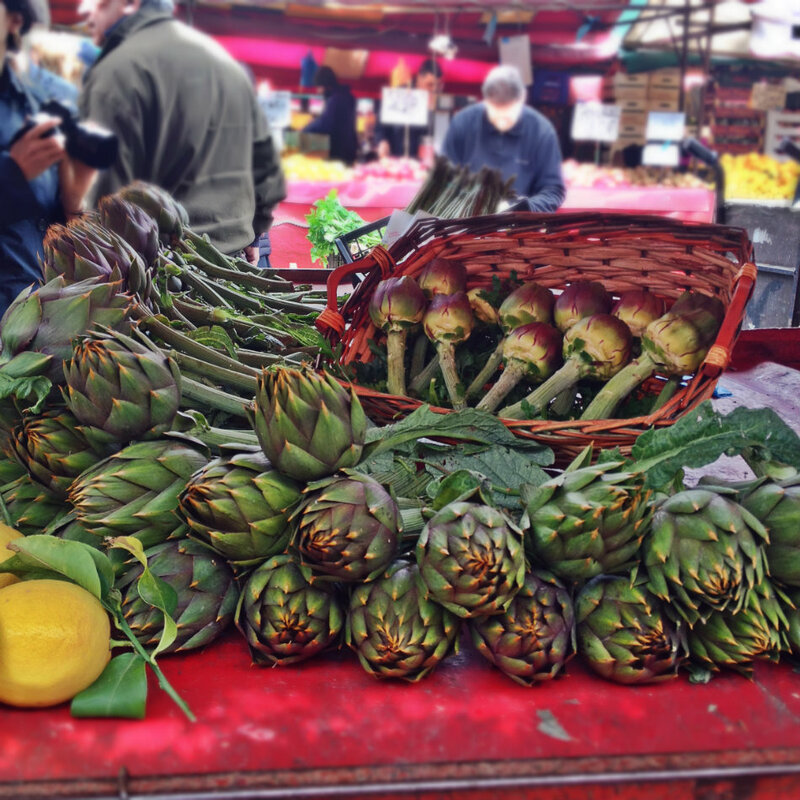 This last reason is perhaps more for people living in Italy rather than travelers; but if you get the chance to visit any market while in Italy, don’t just go for the souvenirs. Go to the markets like a real Italian, ready to wait patiently in line (or stand your ground, as the case may be) for the fresh produce. Because here, spring brings a bounty of fresh, local greens—monk’s beard or agretti, bitter cicoria in a dozen varieties, novelle potatoes, asparagus, peas…and with the end of May to June come the cherries, strawberries, peaches, and plums that I gorge myself on until summer’s figs and prickly pears and melons. The markets are suddenly overflowing, and so, too, are the supermarkets and stores, which still know how to supply locally and seasonally. 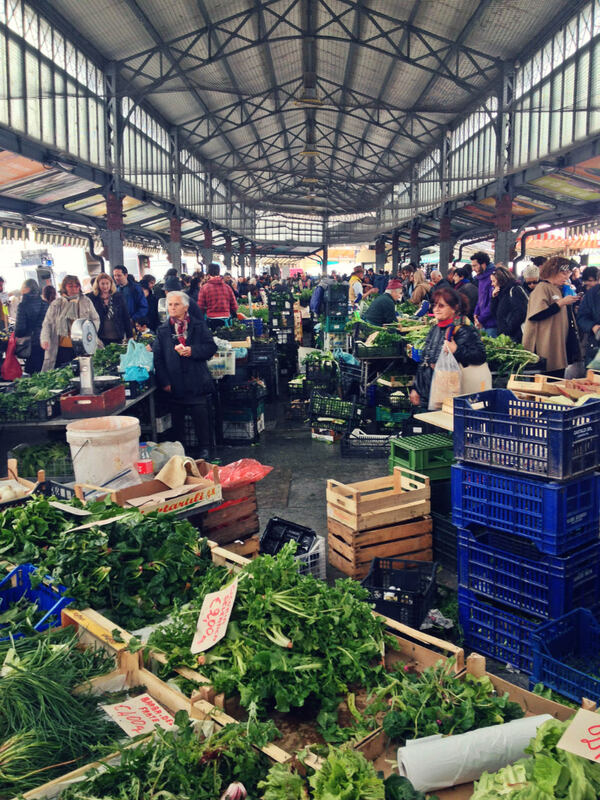 And if you’re not inclined to grocery shop while on vacation, if you avoid the tourist trap restaurants, then the majority of osterie and trattorie serve up wonderful seasonal dishes. I totally agree! I do prefer Autumn, but I love Spring and everything it offers.